Walpole Country Club was first incorporated as a country club in 1927. The existing course was designed by Al Zikorus in 1974 with slightly modified pushup greens. In 2012 then GCS Mark Gagne entrusted our process to three of his more problematic greens with good results. 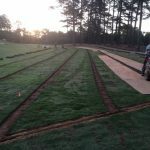 The club had planned to complete the balance of the greens in due time, but in part because of the fine turf management programs in place the need for greens drainage on the balance of the greens was put off until different challenges occurred in the summer of 2015. Last year turf decline was experienced on most all of the greens at Walpole CC and after extensive soil and irrigation water testing it was determined that high sodium content was evident in both mediums. The source was determined as road salt runoff in the large watershed entering the irrigation pond. Long term solutions include drilling wells to augment the salty water to make it more suitable for turf irrigation. Short term solution was to immediately begin flushing the greens to push the sodium deeper into the soil profile. As this was done the three XGD greens immediately improved as the water had a place to go. The balance of the greens still struggled mightily as the salt wasn’t flushing deep enough into the soil profile to improve turf health. 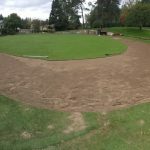 So, the club signed on to complete the rest of the greens this spring and XGD Project Manager David Welsh is on site completing the installations. XGD has completed several projects in California of salt flushing and it may become more prevalent across the rest of the country as well. So please reach out to us if we might aid your facility in improving turfgrass health relative to high sodium issues.